The official mascot of the 2018 Drake Relays lives in Pella. 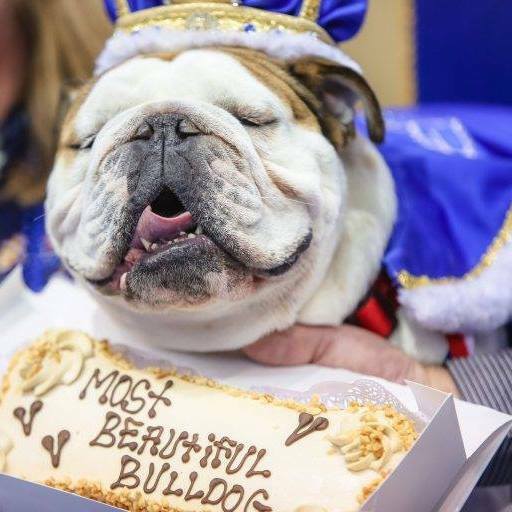 The winner of the Drake Relays Beautiful Bulldog contest is Bow-Z. The two-year-old was adopted by John Hill of Pella last summer. During the contest, each contestant walks the runway in Des Moines while an emcee reads the contestant bio. This is the time the pups show off their stuff. After crossing the stage, a panel of judges will contemplate the winners of each award category, including: Drake Spirit, Family Theme, Best Dressed, Congeniality, Rescue Dog Recognition, Porterhouse People’s Choice, Second Runner-Up, Runner-Up, and Most Beautiful Bulldog. Bow-Z will be the official mascot of the 109th Drake Relays this Thursday through Saturday.